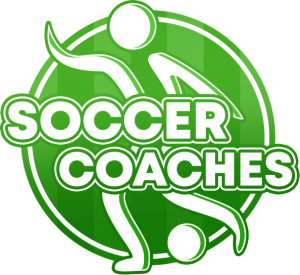 9 motivating soccer drills for kids that are movement intensive, create a fun atmosphere and create experiences which appeal to the children’s imagination! The playing field and the equipment should be well prepared. In general, with a little improvisation, many available devices can be used. The group size should be manageable for the coach. Existing field markers (lines) can be used for the pitch layout. It may be necessary to add supportive lines with cones. This simplifies the orientation in space as well as it supports the coach in the formulation of precise location information. – The coach joins the group and plays himself. – A player is used as a so-called joker, he plays always with the ball-possessing team. and at the same time having one foot (left or right) in the ring. a number, here 1 to 8. 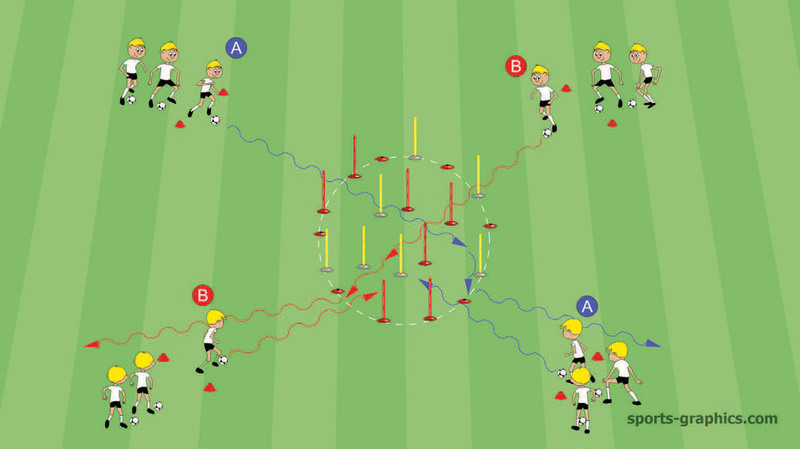 • All players dribble freely in space and have a number. dribbles as fast as possible around a cone he chooses. • The other players react as quickly as possible and follow him. • The last player back in the field gets a jersey. • The first person to have 3 shirts is the loser and everyone else is the winner. 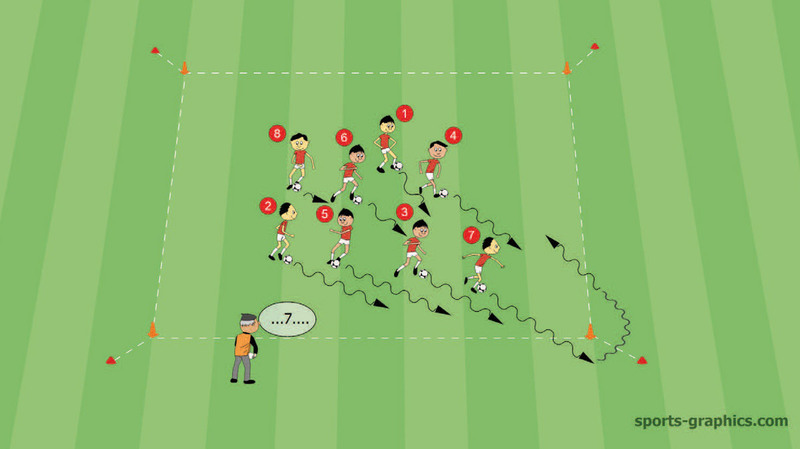 • Players take their ball in the hand and sprint around the cone. dribble around the diagonally opposite cone. • Reaction speed and orientation are required. no ball, the rest dribbles. coach and look for a new ball. • Two players come away empty-handed. through as many goals as possible. 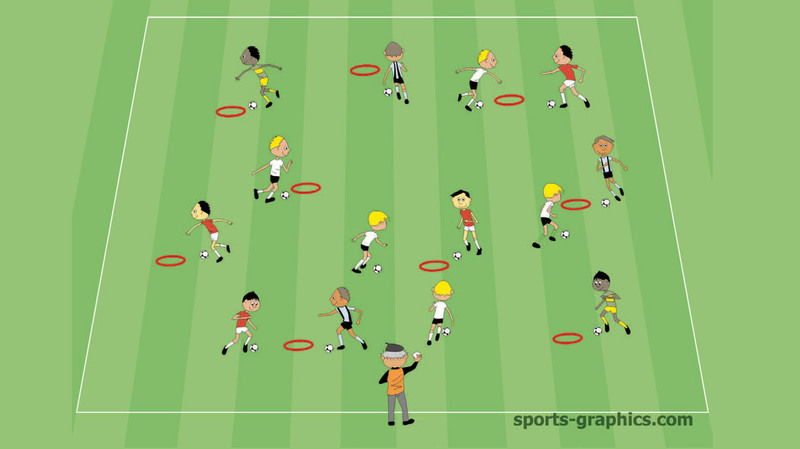 • After a red goal, players may only dribble through a yellow goal. • Which player scores the most goals? • Only dribble through the gates with the right or left foot. In a room about 20m x 20m are 2-4 tires less than participating players. • The players dribble freely in space. not find an island. They get a minus point (holding jersies in their hand). • Whoever holds 3 shirts has lost. 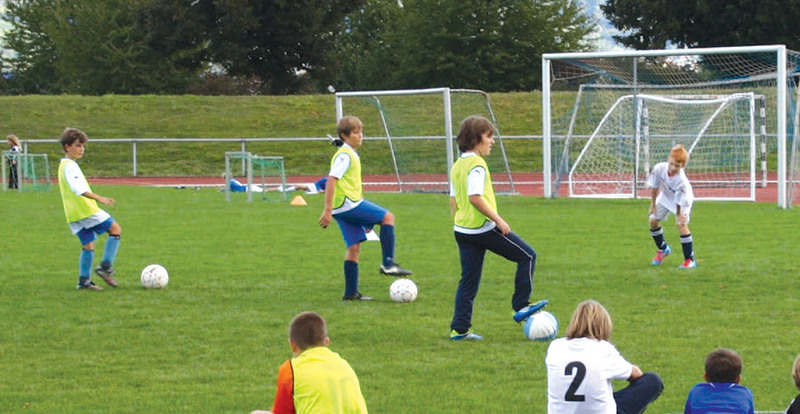 they learn the dribbling with raised head and perception of the environment. which they can improve and refine their dribbling techniques. circle 6m, team A and B position opposite each other. 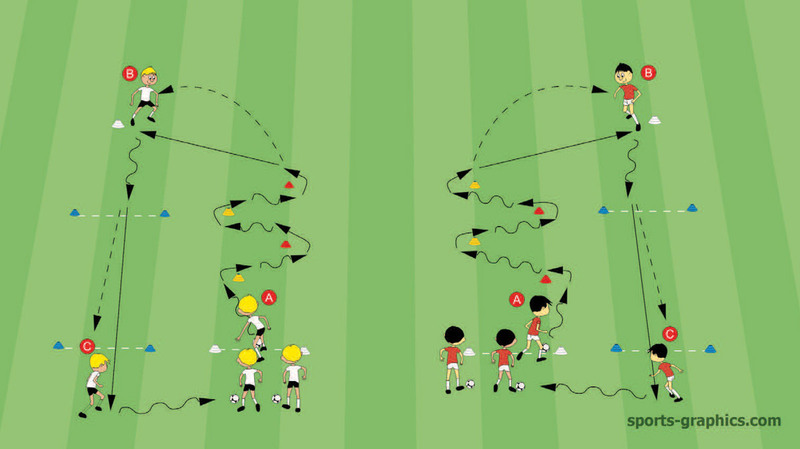 hands and hands over the ball to the next player (poles must not be touched). The poles are set up in such a way, that players can not walk or dribble straight. over the ball and so on. 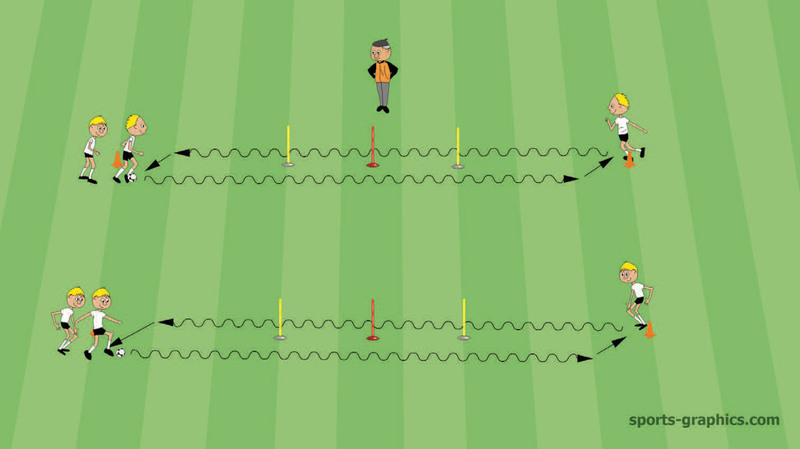 ball, distance of cones 8 to 10 meters, 3 poles in the middle (distance 1m). the ball behind the pols with his left foot to the approaching player. (two-footedness), no more than 5 players per team. 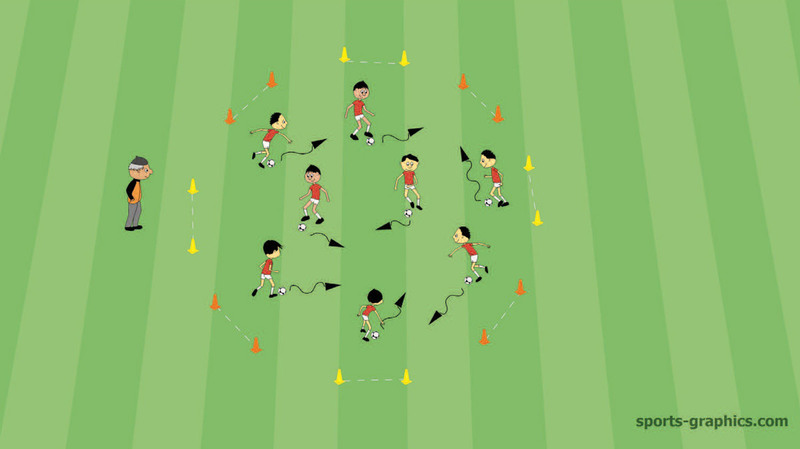 • C controls the ball and dribbles to the end of the group. • The team gets one point for each targeted pass through the blue cone-gates. • Change after 3 minutes. • Which team has the most points overall? 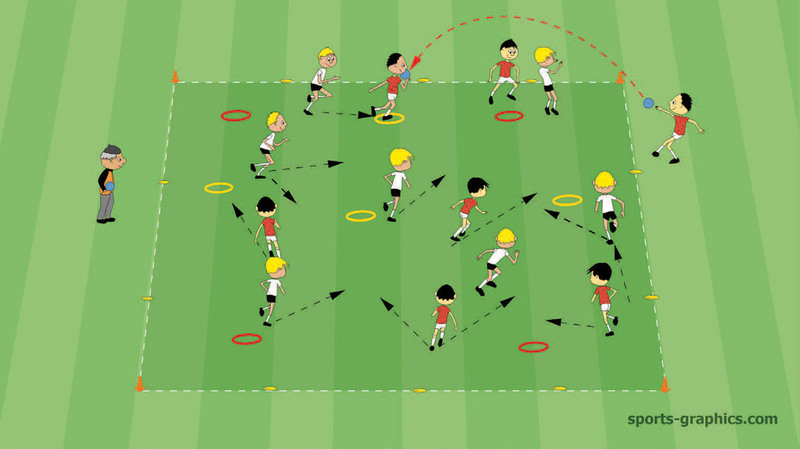 • Dribbling and passing are trained in this competition. 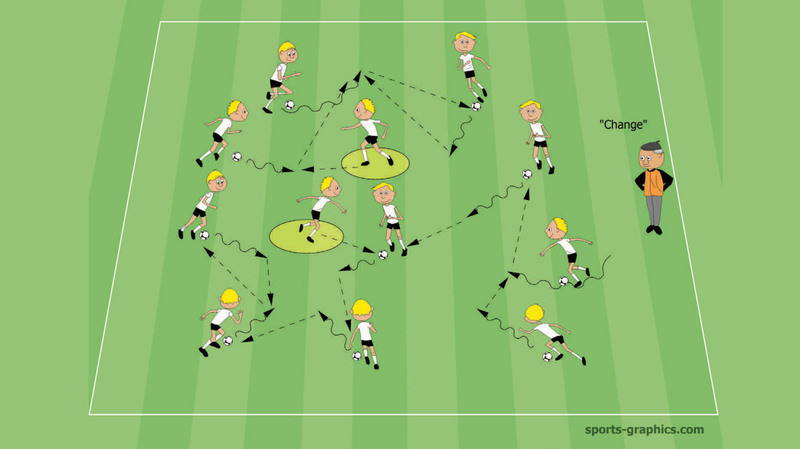 We hope you will have as much fun trying these soccer drills with your players as we had creating them! 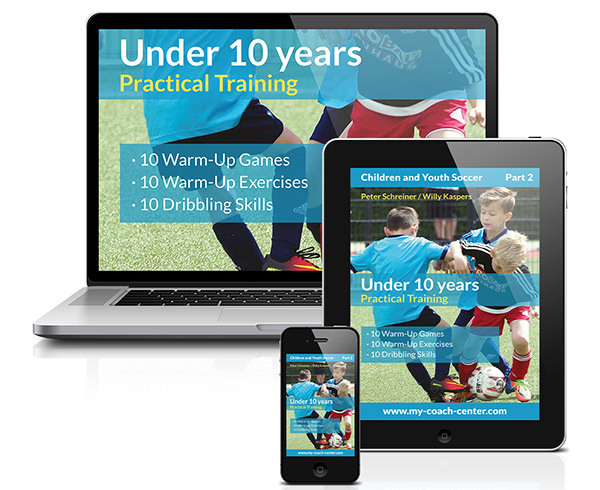 If you would like to know more about practical training for kids and youth-teams, take a look at “Practical Training for U10” with many more drills and games for young players!